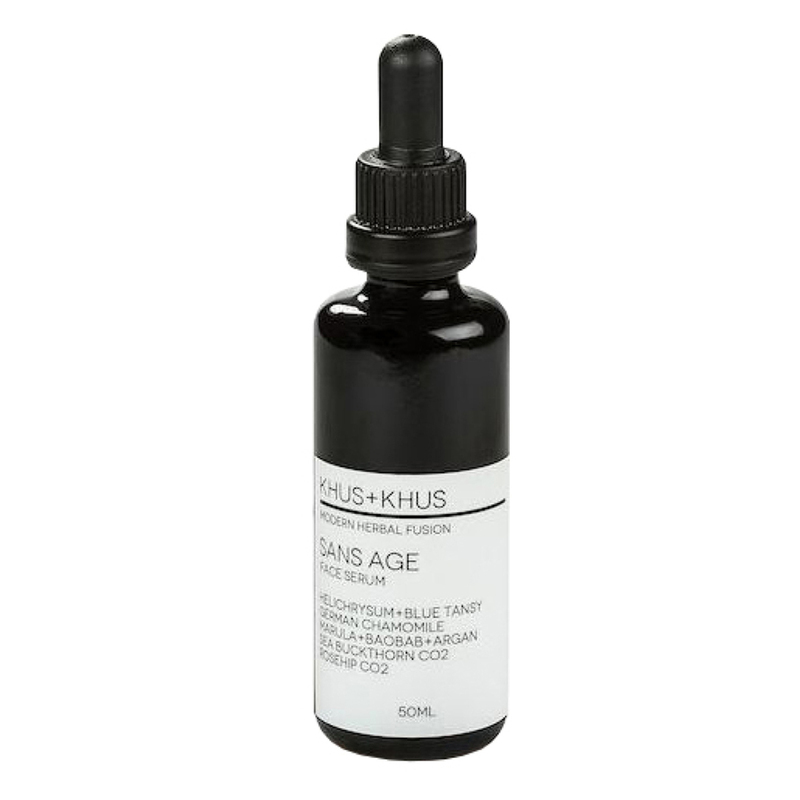 Sans Age Face Serum by KHUS+KHUS skincare products is formulated with ingredients to diminish signs of inflammation, and increase a look of vitality and youthfulness in skin. This serum evokes sensations of peacefulness and relaxation, lends a cooling feel, and bestows a quality of good energy. It also helps to alleviate feelings of nervous tension and insomnia. Apply evenly to clean, damp skin, pressing serum onto face with your palm to improve the look and feel of skin. I am 50 with very sensitive skin that craves moisture. Having tried many green serums and moisturizers over the past five years - and having experienced a number of allergic reactions - I was both excited and nervous to try the Sans Age, as it contains a number of key ingredients I had not tried before. I used only in the PM, after cleansing and toning, and my complexion looked calm after applying and just as calm and smooth the next morning. This is a rather thick serum that has a lovely fragrance similar to Josh Rosebrook's Advanced Hydration Mask. I wish it were less expensive, but it's definitely a high-quality product that I will consider purchasing again if my budget allows. Soothing scent, effective against redness. I have been using this at bedtime for the last two months. That's a good time to use it because the scent is very relaxing. I am not sure if it is more or less effective against aging than other face oils. However, I have red cheeks with visible/broken capillaries, and there was noticeable reduction in redness. It does have an oily, slick feeling on the skin that takes longer than some other face oils to absorb. I will keep trying other things but this is quite nice. This is a beautiful product, and makes me want to go to bed early so I can slather it on my face. The camomile is like a lullaby for my skin before sleep.